Prudence Ndlangisa knew she was having more than one baby but she never imagined she’d be the proud mama of five babies – at once. In an exclusive interview, DRUM spoke to the Gauteng mom who’s the first woman to give birth to quintuplets in South Africa in 24 years! The 30-year-old described the birth of her babies as a blessing. “I am so blessed to have been given the gift of these five healthy babies,” Prudence says. “I would like to thank Dr Pitsoe, the Clinix Botshelong Hospital in Vosloorus, as well as the entire medical team who took such good care of me and my babies. 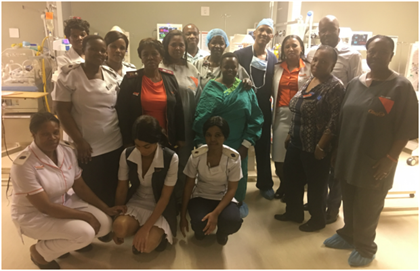 Speaking to DRUM, Dr Moeng Pitsoe – the lead physician who was a part of the incredible team who delivered the quintuplets – said the extraordinary birth of four girls and one boy at Botshelong Hospital came as a complete surprise them. “We never knew there were five babies in there,” Dr Pitsoe says. The other two babies were hidden and even the ultrasound scans showed Prudence was expecting triplets, according to Dr Pitsoe. The babies’ names are Siyanda, Sibahle, Simesihle, Silindile and Sindisiwe – and they’re healthy and have since started breathing on their own. “The babies are good and all weigh more than one kilo,” says Dr Pitsoe who has been a medical practitioner for the past 24 years. “This is a great story because this is the first time in the history of this country, and only the third time in the history of the world, that babies [survived] living the first seven days as a group of five,” Dr Pitsoe says.